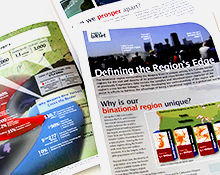 Recognizing the importance of the Buffalo Niagara region’s international boundary, the UB Regional Institute initiated Region’s Edge, a research and civic engagement initiative that focuses on issues of binational governance, economic integration and related policy implications. Launched in June 2007 at a forum engaging leaders from Buffalo Niagara’s binational region, the initiative is centered on the collection and analysis of data to shed light on binational governance and policy issues. Program products include several policy briefs and engagement in binational conferences and forums, with nearly 100 binational regional leaders from the public, private, nonprofit and academic sectors attended the first briefing. This entry was posted on May 9, 2014 .